The Mets beat the Yankees Monday night, 8–5, for their second consecutive win, and fourth in five games, and sixth in nine. They’re coming off their first consecutive series wins since April, and recently got long-suffering Jacob deGrom his first win since mid-June. Things are finally looking ... know what, let’s not even go there. 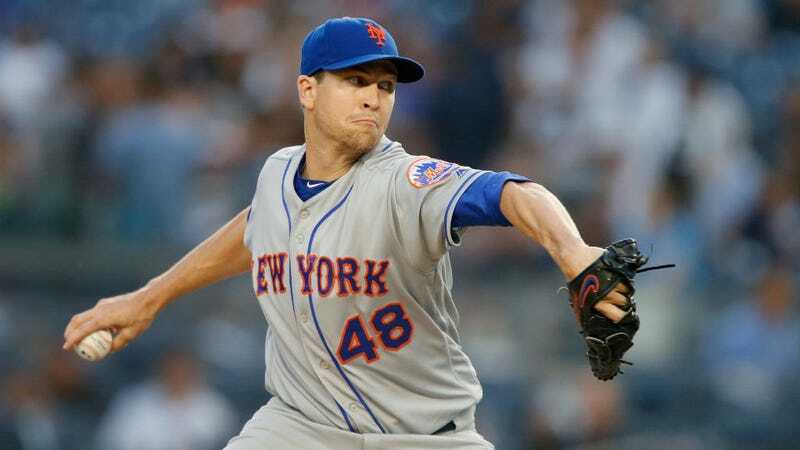 But where deGrom’s win on Wednesday over the Marlins was notable for breaking up deGrom’s season of misery, deGrom’s win Monday night over the Yankees was notable for being the first time deGrom recorded a win while allowing more than one earned run all season. DeGrom allowed two earned runs over six-plus innings, striking out 12 along the way. It wasn’t deGrom’s very best performance—he allowed two whole runs! Two!—but it was enough to earn a standing ovation at Yankee Stadium, from appreciative Mets fans and covetous Yankee fans. Leave it to the Mets to start stringing together competent performances in the part of the season when absolutely none of it matters, but when it can provide a glimmer of fool’s-gold optimism for next season. Behold A Cursed Phrase: "The Worst Loss In Mets History"